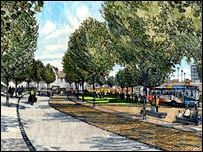 People in Ashford are being given the chance to have their say on £10m plans for a makeover of the town's ring road. The proposals are for a two-way route with narrower carriageways and a 20mph speed limit. 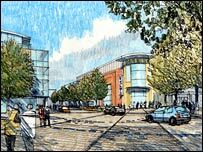 Paul Clokie, leader of Ashford Borough Council, said the scheme would "transform the town centre" and "help deliver Ashford's growth". The proposals were on display on Friday and again on Saturday (1000 BST-1500 BST) in Lower High Street. Representatives from Ashford Council and Kent County Council (KCC) were on hand to answer questions. "The town centre will become a place to shop, work, trade, relax and live," said Mr Clokie. Graham Gibbens, KCC's cabinet member for regeneration, added: "This new scheme will help to open up Ashford and make it a better place for everyone." The new ring road would be pedestrian-friendly, with public areas planned at main intersections which could also be enhanced with specially commissioned works of art. Ashford has been identified by the government as a major growth area in the South East. The borough council said changes to the ring road were needed to accommodate 31,000 new homes and 28,000 new jobs which are planned by 2031.